Fall Protection violations in the construction industry have been among the highest cited OSHA violations for many years now. The Fall Protection standard, found at 29 CFR 1926.501, provides for residential construction, unprotected sides/edges, roofing work on low-slope roofs, steep roofs, and holes and skylights. Operational tasks are commonly in competition with performing safety procedures. When employees finish a job ahead of schedule, or even on time, project managers boast on how quickly a worker completed his/her work assignment which makes the worker feel rewarded by management. However, what happens to the employee who takes time to perform proper safety procedures when the job is already behind? Managers often make those employees feel ostracized, therefore discouraging reporting. This type of linear thinking goes against the goal of continuous improvement when it comes to Safety. 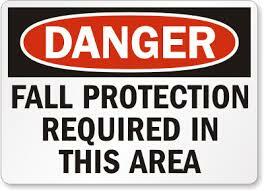 Employees should in turn be recognized for observing unsafe conditions. It is imperative to create a recognition system for employees who take the time to ensure an accident-free jobsite. An employee is less likely to take the time to follow all the necessary fall protection steps while trying to get a task done if their body is under significant stress from cold or hot temperatures, if it is raining, or if debris is getting kicked up on a windy day. It is inevitable that these conditions will affect any outside worker at some point in time. An employer must be able to recognize these weather conditions and be ready to adjust work by reevaluating the task. One suggestion is to rotate workers from outdoor tasks to work that can be completed indoors or adding a tarp or piece of plywood to block inclement weather. Employees can have major events pulling at their attention such as home repairs, disobedient children, or family deaths. Every employee is not going to vocalize their problems while other may vent with other employees to make it known. Look for signs like a change in personality or a change in performance. Combat the distractions by partnering employees on a task. Working in a team can encourage the individual to not get lost in their own thoughts. If an individual is too distracted, it may be safer to send them home for the day. Ensure adequate fall protection devices and guardrail material are available at the jobsite. By having it on-hand, the employees will not feel burdened with having to stop their tasks to walk across site to find it. While employees are focused on the task at hand, it may not cross their minds that there may be overhead hazards in their work area. This may be a good opportunity to engage the supervisor to inspect the jobsite together to learn from any at-risk conditions that are observed.